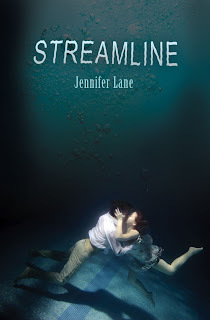 Good Choice Reading: Streamline by Jennifer Lane Blog Tour: Excerpt & eBook giveaway! Streamline by Jennifer Lane Blog Tour: Excerpt & eBook giveaway! Leo saw Audrey on T-court before she could see him, and she’d never looked prettier. She’d pulled her thick auburn hair up high in a ponytail, and a sleeveless white shirt accentuated the soft curve of her breasts and hard definition of her arms. Eyelets and tiny sky blue flowers detailed the shirt, which she’d tucked into a navy blue miniskirt. Beaded sandals completed her cool summer ensemble. Already sweating in his whiteworks, Leo’s body temperature rose further just looking at her. Ignoring his mother and her companion, he ran toward his unsuspecting girlfriend. At the last second Audrey noticed him and gave him a dazzling smile. He scooped her up, twirling her around. In that moment, Leo finally released the tension he’d been holding throughout Plebe Summer. It was now Audrey Summer, and the hairs on his body stood at attention as he held her tight. “I missed you so much,” Leo whispered into her ear, cradling the nape of her neck. “Good to know you’re still competitive.” He smirked, holding her face next to his, cheek to cheek. Eventually Leo let go to greet his other visitors. We're giving away one eBook copy of Streamline by Jennifer Lane to one lucky commenter. All you have to do is leave a meaningful comment below, include an email, twitter, anyway for us to contact you. This is open international as long as you have a way of reading the book. This giveaway ends one week from today. Streamline appears to be quite an emotional read. I think it's interesting how the love interests (which is my favorite part of every story!) are already boyfriend and girlfriend at the onset. Good luck with your book tour! awwwwww that is such a sweet excerpt! I really want to read this book. I've heard nothing but good things about it!! That was such a sweet excerpt! Possibly the sweetest I've read. I like that the story doesn't sound very typical to the other YA's that I've read. And that cover is definitely eye-catching. Thanks for the chance at the giveaway! I enjoyed the excerpt. I love the idea that this story has so much going on in it. I will definitely be reading it, but I love the chance to win it. Thanks! Thanks for the excerpt, the book sounds really good!! Thanks for the chance to win! Wow...great excerpt. Looks like a heart tugger for sure! Not the usual book I'd look at, but I find myself putting it in my wish pile anyway. I couldn't seem to help myself!! Thx for this AWESOME giveaway op! Wow!!! I LOVED the snippet! I was just reading a review of this book the other day! I'm soo excited to read it! oh wow!!! very interesting. i've never read a YA on two characters with military families...count me in. Excellent! !I can not wait to read!! I need a great summer read. This would be perfect. Thanks for the chance to win!! It's surely a complicated story which has a lot of emotional and tensions. I do love the synopsis. Just from the description of how he looks at audrey and the way that Leo meets Audrey are so beautifully written. I can see how leo is head over heels. This cover is so cute. It reeled me in. I'm really liking the sounds of Streamline, and enjoyed the excerpt. Definitely going to be quite the emotional read...plus I love the fact that Leo and Audrey are already a couple! Great excerpt and love the cover! Definitely on my TBR list!